Use our resources to learn more about Africa’s rich human geography. Klaas Kruiper, a member of the San community in Botswana, strings a bow as his son Jeffrey sits beside him. This is an unusual photo; very few San live as hunter-gatherers. The San people have drafted a code of ethics for researchers wishing to study their culture. Who are the San? The Khoe-San people, collectively referred to as the San, are an indigenous group native to southern Africa. The largest San communities are in Botswana, Namibia, South Africa, Angola, and Zimbabwe. For now, the new code is only being adopted in South Africa. San leaders plan to introduce it to Botswana and Namibia next. Why are researchers so interested in the San? Genetics: According to the South African San Institute, “geneticists say that the oldest gene pattern amongst modern humans is that of the Khoe-San. It dates back to about 80, 000 years ago. 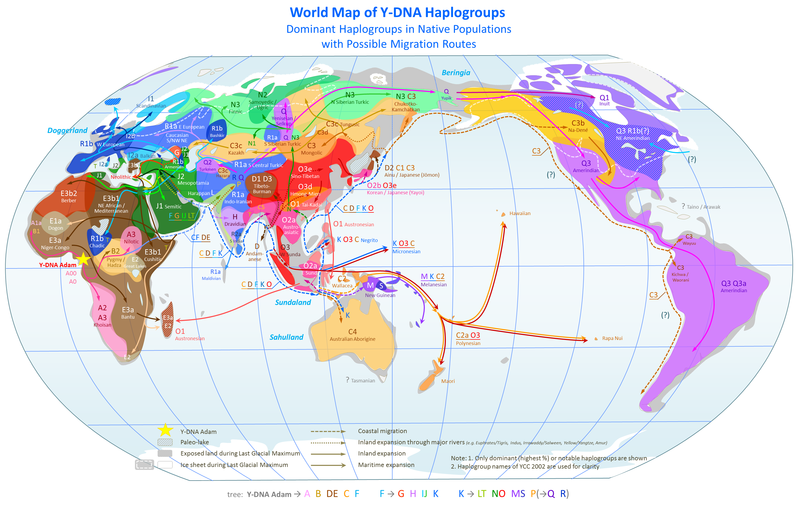 All other peoples on the planet … are all descendants from this original gene type.” San Y-DNA haplogroups are sub-groups of haplogroups A and B, visible on this gorgeous map. According to the Genographic Project, the Khoe-San “are perhaps some of the oldest populations in Africa, and they have a unique genetic pattern that sets them apart from most other African groups.” “Unique genetic patterns” are always of interest of geneticists! Traditional San culture has been a rich source of anthropological research and field work. Some early scientists called the San the “Bushmen of the Kalahari,” a name that unfortunately stuck and many San consider derogatory and offensive. Why have the San drafted a code of ethics for researchers interested in studying their culture of genetics? The San created the code because of past transgressions, including use of insulting language such as the term “Bushmen,” taking photographs of people without their permission (including children and breastfeeding mothers), and offers of bribes. The San have not always benefitted from the sharing of traditional knowledge. In particular, pharmaceutical companies have profited from sales of indigenous plant varieties without sharing those profits with the San. What does the code say? Take a look at it here. The code is divided into five sections. Respect. The San require that researchers respect individuals and the San community as a whole. This may include acknowledging San contributions to research, protecting privacy, and engaging with the community before field work is carried out. Honesty. The San require an open and clear exchange with researchers about the focus and methodology of the proposed research. Justice and fairness. The San require that research benefit the San participants and community in some way. The document goes out of its way to say the benefits need not be financial, but might include co-research opportunities, sharing of skills, and roles for translators and research assistants in field work. Care. The San require that research be aligned to local needs and improve the life of the San. This extends to participants, families, communities, and the physical environment. Process. The San require that researchers follow the protocols established for each step of the proposed research project. What impact does the code have on researchers? The code does not place unrealistic demands on scientists, says a geneticist working in South Africa. Good researchers should already be following codes of respect, honesty, fairness, and academic rigor. Some researchers are critical about the possible inability to reuse data. The San refuse to grant consent for other researchers to reuse data for purposes not specified in the original agreement. “Other researchers need to be free to reanalyze the data to come to their own conclusions … If this is not possible, then science cannot be done,” says another geneticist. Are there other examples of indigenous groups drafting codes of ethics for researchers? Aboriginal Australians, First Nations, and Inuit groups have all established similar guidelines for researchers. The San are the first Africans to draft such a code. Can you think of other groups analyzed by researchers that might benefit from drafting a code of ethics? If researchers were interested in studying the physical or cultural characteristics of your family or community, what codes would you expect them to follow?